Abe is haunted by the sudden loss of both of his parents. Left to manage a New-Hampshire land grant and its troublesome Royal Navy mast trees, with only his eccentric aunt to guide him, he finds comfort in a new friendship with Betty, a decidedly odd neighbor. Defying the Royal Governor’s crackdowns and his aunt’s commands, Abe makes choices that put him on a collision course with both. With rebellion in the air, Abe must escape detection by the Governor’s agents and solve the puzzle of Betty’s past in order to secure his future. 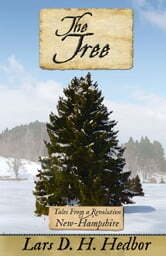 The Tree is Hedbor’s standalone novel set in New-Hampshire from his Tales From a Revolution series, in which he examines the American War of Independence as it unfolded in each of the colonies. If you like enthralling stories of familiar events from unfamiliar viewpoints, you’ll love The Tree. Grab your copy of The Tree today, and experience the American Revolution as a personal journey of discovery.